How are the cardinal points (North-East-South-West) defined? On equatorial regions it is somewhat obvious. But what about the higher latitudes? If the pole star is up above the sky instead of horizon, how do we define North? What is the case on the geographic poles? A (geographical) meridian (or line of longitude) is the half of an imaginary great circle on the Earth's surface, terminated by the North Pole and the South Pole, connecting points of equal longitude, as measured in angular degrees east or west of the Prime Meridian. From where you are standing, North is the direction on the horizon along this meridian or "line" of longitude that extends to the Earth's geographic North pole, and South is the direction on the horizon 180 degrees opposite, towards the South pole. East and west are the perpendicular directions, which are also found extending lines of latitude from where you are standing towards the horizon. Locally you can think of the region under your feet as flat, and so North, South, East and West all form right angles even far from the equator. Close to the poles, none of that changes mathematically, and exactly on the poles those terms suddenly no longer have any meaning. 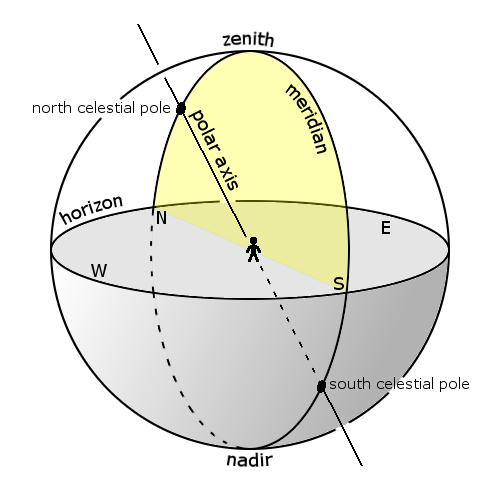 In astronomy, the meridian is the great circle passing through the celestial poles, as well as the zenith and nadir of an observer's location. Consequently, it contains also the north and south points on the horizon, and it is perpendicular to the celestial equator and horizon. A celestial meridian is coplanar with the analogous terrestrial meridian projected onto the celestial sphere. Hence, the number of celestial meridians is also infinite. Not the answer you're looking for? Browse other questions tagged earth pole or ask your own question. How to calculate right ascension of Greenwich? Why is it that we can"t feel how fast the Earth is moving? How to explain that Polaris is a circumpolar star in the sky of any North America city?